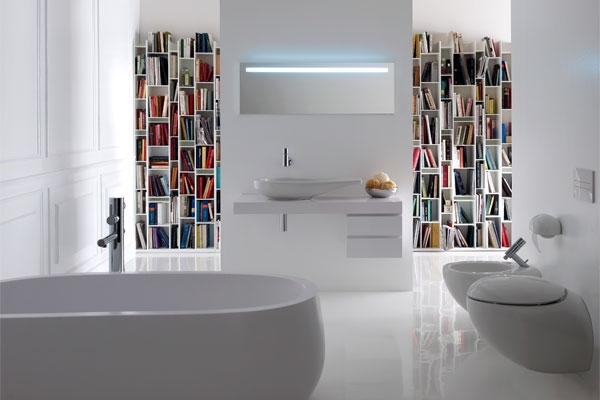 The iconic ILBAGNOALESSI One collection from Laufen, launched as a prototype in 2014 and initially sold through a limited number of retailers, is now available throughout the Laufen retailer network. Sporting the same elegantly soft curves and beautiful design that have become synonymous with this legendary range from Italian designer Stefano Giovannoni, the latest additions stay true to form, with timeless pieces designed to integrate seamlessly into the contemporary bathroom. All the beauty and elegance of the collection’s original ‘Tuna’ countertop washbasin is now available in smaller sizes, of 900mm or 1200mm widths, making them ideal for any bathroom space. The washbasin’s sculptural bowl is combined with an easy-to-wipe clean countertop shelf, while its gentle curves and soft lines combine perfectly with furniture from the same range, in a choice of Canaletto walnut or a white lacquered finish and now available in a new 2400mm wide unit to accommodate double washbasins. Also in the ILBAGNOALESSI One collection is a luxurious solid surface bathtub, available as either a freestanding or built-in version and with an optional air massage system. This is joined by a new siphonic WC, crafted from one-piece for a seamless, hygienic finish that offers a powerful flushing performance. Introducing Laufen’s revolutionary new ceramic, SaphirKeramik, into the collection for the very first time, the new additions also include accessories made from this material, including a shelf towel holder, a toilet paper holder and a hanger.